Smaller​ schools​ – the non-FBS​ programs – routinely produce big-time​ NFL players. At No. 36 overall, linebacker Darius Leonard was​​ the first small-school player selected in the 2018 NFL Draft. The former South Carolina State star led the NFL in tackles (163) as a rookie, earning Defensive Rookie of the Year and All-Pro honors. Adderley has the bad habit of taking the cheese, but he has the essential ingredients of a starting NFL free safety with his play speed, toughness and ball skills, projecting best in a single-high role. He should be the first small-school player drafted in the 2019 class. A high school quarterback who walked on at Alabama State to play tight end, Howard is a talented lump of clay with sloppy tendencies, but all the raw tools are there for him to develop into an NFL starter. Pipkins is inexperienced vs. top competition and needs technical work, but he boasts an NFL frame with the balanced movements and length to develop into a solid depth piece with potential to be more. Although he lacks elite vertical speed (4.51 40-yard dash), Brown has balanced feet and NFL-quality ball skills, displaying the efficient transition to stay on top of routes and make plays at the catch point. A college left tackle who projects best inside, Forbes drops his hips and flashes a forceful, upward punch, competing with a nasty streak. He tends to overextend at times, but his lower body is patient and controlled in pass protection. One of the top Division II prospects in the draft, Ballentine is quick-footed and coordinated in his movements, getting physical at the snap to bump and run. Although his average athletic profile limits his role at the next level, Doss displays crafty routes (all of his movements have purpose) and natural ball skills, projecting as a physical, possession receiver in the NFL. A mammoth square blocker, Udoh will have trouble with edge speed and he needs to consistently unleash his power, but the baseline talent is evident when his weight is under control. An LSU transfer, Ferguson, who is the younger brother of pass rusher Jaylon Ferguson, is an intriguing size/speed athlete (4.45 40-yard dash) with ball skills, projecting as a developmental receiver. After missing the 2017 season (academics), Miles returned in 2018 and put himself on the NFL radar with an intriguing mix of size, feet and length (35 5/8 inch arms), projecting at either tackle or guard. 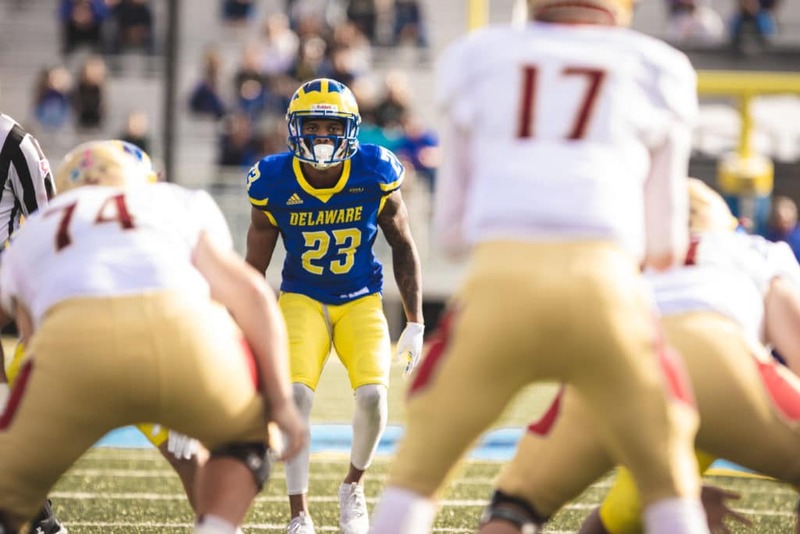 A former wideout, Denmark made the move to cornerback and developed a defensive mentality, displaying the outstanding speed and aggressive nature that drew the attention of NFL scouts. One of the most accomplished players in FCS history, Stick has an average arm but he exudes competitive toughness and razor-sharp intelligence, boasting the winning resume NFL coaches will appreciate. Although he needs to clean up his body mechanics, Hitner, who started two seasons at right tackle, has terrific body control and flexibility to mirror and tie up rushers. A tall, lean slot target, Parham is a loose-jointed athlete with a humongous catch radius to pluck and create after the catch, picking up speed when he can stretch out his long strides. Although he is undersized with little growth potential, Moreland competes with the requisite mental and physical toughness to press on the outside or hold up in run support. A college left tackle who will move inside in the NFL, Opeta’s base technique isn’t quite ready for NFL rushers, but he moves with coordinated feet and utilizes angles well to shield lanes. Roberson tends to rely on speed and effort over technique as a rusher and needs to show a better plan, but he bursts off the ball and is quick to close. There is never a play out of his range due to his relentless motor. Although his lack of a power move makes it easy for blockers to slow him down, Johnson gets upfield quickly with the cornering skills to dip and skim blockers, flattening to the quarterback.